I was a rambunctious boy. I know that description seems redundant to most mothers who have raised boys. Sitting still was not a possible option. I was made to fidget, fiddle, and explore. As a result, some of my not-so-cherished feats were inevitable. I tripped. I stumbled. I spilled. I made messes. I tracked in mud. I broke things. Two of the things I broke were precious. One was a white marble horse on a black marble slab. The other was a pink lamp. After I broke them, both mocked me for years. I loved that white marble horse at Granny's and G-daddy's house. I would take it down and admire it every time I visited. I loved horses, but I am not sure why this one small statue of a wild white stallion so captivated me. On one of the visits, I apparently broke it. I have a haunting memory of hearing it hit the rock fireplace and feeling the brittle sounds of it breaking somewhere down deep in my soul. I know I am the one who broke it because everyone would tell me I broke it every time we visited. G-daddy, my dad's dad, glued it back together. Every time we came for a visit, there stood the white stallion mocking me, reminding me of my failure — this beautiful white stallion, now with visible glue lines and missing one small piece. This was a fixed reminder of my rambunctious clumsiness that remained with Granny years after G-daddy died. The glue yellowed over the years, only drawing more attention to the cracks. That horse, once so precious to me, became a haunting reminder of failure. We called my mom's mom, Mama Faye. Daddy Gordon had died when I was young. Mama Faye was living alone in Austin in an apartment when I came to stay with her a week one summer. She had a pink lamp on a little desk near her front door. She cherished that lamp. I am not altogether sure why, although I think it was because it was in my mom's room when she grew up as a girl. Mama Faye had to be gone out for a bit and left me alone. She specifically asked that I not throw things while she was gone. I had a GI-Joe — one of the old-timey big ones, not the dinky ones they have today. I attached fishing line to all sorts of things. Then, I would let GI-Joe use the weird grip he had in one hand to hang onto the line. I would give him a little push, and he would zip down the line. With six or seven lines attached to door knobs and drawer pulls and door hinges, I could make him zip all over the room to my own sound effects. It was really quite cool! Well, I had about expended all the joy out of zipping him around the room when suddenly, I decided it would be great fun to push him up the lines and see how far he would go before he let go. This was all quite fun until I gave a mighty shove to my GI-Joe to get him to go up the steep incline from the end table leg to the top door hinge on the front door. As Frenchy - that's what I called my GI-Joe because he was a member of the French underground and had a beret instead of an army helmet - zipped up the line, he let go about half way to the top. Frenchy's momentum carried him to the pink lamp. It happened in slow motion. Crash! The bottom globe of the pink lamp broke. Then slowly, the broken piece fell, hit the desk and shattered on its way to the floor. Meanwhile, the top globe teetered and fell when the bottom piece came off and threw the lamp out of balance. Crash! I cleaned it all up the best I could. I took down fishing line and put Frenchy back into the suitcase. I swept all the glass into a dustpan and put it in a brown grocery bag. Even though I wasn't supposed to go outside the apartment, I quickly snuck across the hall and threw the bag away ... and I prayed that Mama Faye wouldn't notice until after I had gone home a couple of days later! When Mama Faye came back, she opened the door and glanced at the desk. She looked at me and said, "Phillip Dixon, did you throw anything while I was gone?" "No ma'am, I promise I didn't throw anything. But, I was pushing Frenchy up one of my lines and he flew off and ..." I began to cry. "I'm sorry. I'm so sorry ..."
"Well, let's see ... hmm, looks like you got up most of the big pieces, let me get out the vacuum and you can get the tiny pieces." And she did and I did and not another word was spoken about the pink lamp ... ever. Except she never got anything else to put in place of that pink lamp and the empty spot mocked my rambunctious clumsiness until she moved to be near us in her last years with cancer. We have all messed up. Our failures tie us together. We've broken something precious and often we are haunted by the reminders of our failure. Ignoring and pretending it never happened doesn't work — in fact, it sometimes makes things worse. Sometimes, our failures are resurrected by the brokenness they have caused in others. We are simply not able to fix what is broken and the weight of that failure breaks something deep inside us. Before Jesus returned to the Father, he met the apostle Peter and some of the other apostles on the beach of Lake Galilee (John 21:15-17). After a nice friendly dinner of fish, Jesus asked Peter a simple question three times. To put it in rambunctious boy terms, Jesus held a glue streaked white stallion and a dustpan filled with broken shards of a pink lamp in His nailed scarred hands. He made Peter face the pain of his failure. It took Peter till the third time Jesus asked to get it. I wonder if he heard the rooster crow again. I do know he got the point. Then Jesus said, for the third time, "Peter, be a pastor to my people!" Jesus can do what we cannot do. While we can forgive, only Jesus can purify and make whole. He can make the White Stallion whole and the Pink Lamp perfect and in place again. Sure, the devil will help us see the glue lines and the empty spot on the desk as reminders of failures, but the Lord will firmly remind us that we are not seeing clearly. If we own our mistakes and failures and bring them to Him, we can be mended. If we confess our sins, he is faithful and just and will forgive us our sins and purify us from all unrighteousness (1 John 1:9 TNIV). Peter was a rambunctious apostle, full of messes and failures. Even after he met the resurrected Jesus, he would still have a mess or two. Yet after a breakfast of fish and three hard questions from the Lord, Peter would never doubt that he had been forgiven, purified, and made ready to serve the Master. What is your "pink lamp"? 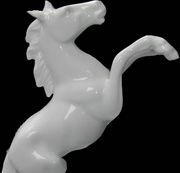 What are the "glue lines" on your white marble horse? Have you confessed them plainly to God? Do you believe that He has not only forgiven you, but also cleansed you? How has God's grace freed you to become the person He has made you to be? I would love to hear your responses on my blog! "Glue Lines and a Pink Lamp" by Phil Ware is licensed under a Creative Commons License. Heartlight encourages you to share this material with others in church bulletins, personal emails, and other non-commercial uses. Please see our Usage Guidelines for more information.